The Axolotl is a "perennibranchiate" salamander (it never loses its gills). I talked about this on the cover page of the site, but what happens when an axolotl decides to beat the odds and metamorphose any how? It happens. And what about the fact that many hobbyists who are interested in axolotls also keep tiger salamanders (Ambystoma tigrinum* and Ambystoma mavortium spp.*)? Metamorphosed axolotls (also known as "transformed" or "terrestrial" axolotls), such as the leucistic axolotl in the photo to the right and the wild type axolotl below left, require the same care as tiger salamanders. Axolotls generally do not metamorphose naturally, but occasionally one will break the rules. Most often, this is due to a genetic quirk or a scientific experiment. It is important to note that most axolotls are unable to metamorphose without the administration of hormones, and this should not be attempted by the casual hobbyist. The common myth of lowering the water level to force axolotls to metamorphose is invariably fatal because most axolotls simply aren't capable of metamorphosis in this way. Some sources mention iodine can be used to induce metamorphosis, but since I'm a PhD Chemist I can tell you that iodine is so poisonous that most people end up killing their axolotls because it's very difficult to change the ppm (parts per million) of iodine in the water by only a point or two unless you really know what you're doing. Iodine solution available at the pharmacy contains alcohol too. I am regularly asked the question "how do I make my axolotl change/metamorphose?". My answer is always the same: don't try. 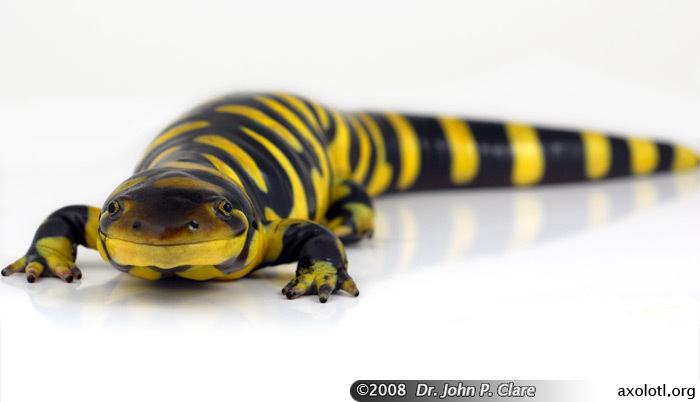 Get a tiger salamander instead. Why? Read on. An axolotl that metamorphoses prior to when it begins to reach sexual maturity will usually lead a somewhat normal life. It will eat the same food and behave in a similar manner to the Tiger Salamander, but it will not live as long. Axolotls that change after they have reached sexual maturity tend to be very weak animals, and usually they don't live more than a year after metamorphosis. They frequently become disinterested in food and it may be difficult to get them to feed at all. Such animals have a grim outlook on life, and sometimes require regular hormone injections just to stay alive. I know this from reading developmental biology articles (see the acknowledgements page linked at the bottom of this one) and through personal correspondence with academics. Add this to the vast personal experience of the people at the Axolotl Forum on Caudata.org, and the message is plain: making an axolotl metamorphose is risky and usually a death sentence, even if that death takes 1-2 years to happen. The success stories are usually spontaneous and don't involve action by the owner. 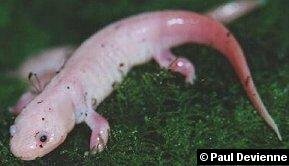 Here is one account of a metamorphosed axolotl and here is another, both from the Caudata.org Axolotl Forum. An adult female Barred Tiger Salamander, Ambystoma mavortium mavortium (formerly known as Ambystoma tigrinum mavortium), from Northwest Texas, USA. A larva of the Barred Tiger Salamander, Ambystoma mavortium mavortium (formerly known as Ambystoma tigrinum mavortium), from Northwest Texas, USA. Looks a lot like an Axolotl, doesn't it? It's important to be aware that metamorphosed axolotls and tiger salamanders are quite different to aquatic axolotls, or tiger salamander larvae. Firstly, their limbs become more muscular in order to support their bodies on land. Their fins are absorbed into the body and the tail becomes more rounded, rather than just flat. A brightly coloured Eastern Tiger Salamander, Ambystoma tigrinum. Perhaps most noticeably, they absorb their gills and their lungs develop in capacity to the extent that they can breathe air directly from the atmosphere. Their eyes bulge out and they develop eyelids. Their body shape also changes - for example, the head becomes more rounded - just compare the photos on this page and you'll see what I mean. Their skin changes in quite a number of ways too: it becomes less permeable to water than an aquatic axolotl's skin, so that it can survive in the air without drying out quickly; the skin becomes firmer and thicker and it becomes more layered than the skin of an aquatic axolotl, and coupled with this, the colour usually changes quite dramatically. 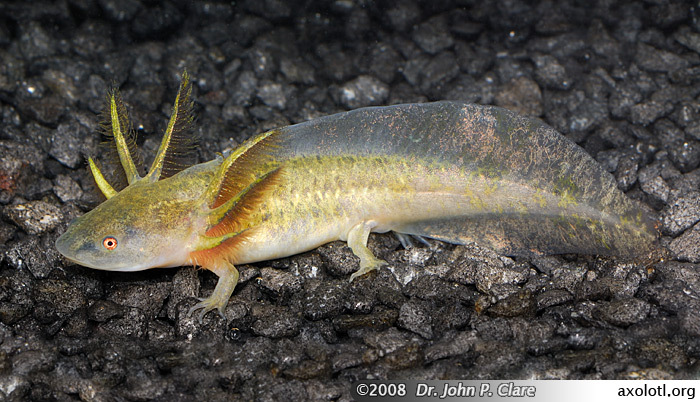 When they metamorphose, brown or wild type axolotls are brown or black with gold, yellow, or white spots. Leucistic/white axolotls retain this white colour (like the one at the top of this page). Depending on the "strain" of axolotl, the colours can be quite varied. Their metabolism also seems to change somewhat. If you have a metamorphosing axolotl or tiger salamander, the half water/half land setup at the end of the housing section of this page (at the bottom) is good for animals in the process of metamorphosis. It's important to make sure that the salamander can get in and out of the water as it wishes, during metamorphosis. Both tiger salamanders and axolotls are members of the Ambystomatidae (literally meaning cup-mouthed) family of salamanders. The Ambystomatids are commonly called mole salamanders because they like to burrow in soft soil and leaf litter. Their natural habitats include forests, swamps, and other areas of North America, Canada, and parts of central America. In captivity, they like to have the ability to hide away and burrow when necessary, so when housing them it is important to bear this in mind. An all-glass aquarium measuring 45 long x 30 wide x 30+ cm tall (18 x 12 x 12+ inches) is adequate for one tiger salamander or metamorphosed axolotl, though obviously the bigger the better. What you put in this vivarium is fairly flexible. Many people just use a layer of of sphagnum moss about 5-8 cm deep (2-3 inches) for the salamander to burrow through and under, with a water bowl large enough for the salamander to fully immerse itself (use dechlorinator on the water, just to be certain it won't harm the salamander). 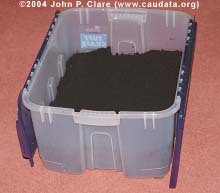 Although this sort of vivarium is adequate, it is not ideal: tiger salamanders and axolotls do better in vivaria in which they can burrow in soil or potting compost. Digging down 8 cm, I unearthed a tunnel containing this little fellow. As our friend on the right demonstrates, a much better setup would be a 60 cm (24 inch) aquarium with a layer of soil about 6-15 cm deep (several inches). The soil is for burrowing, and this may be at least partly covered with a centimetre (half an inch), or more, of leaf litter. A few small potted plants can be buried in the soil in their pots, and some pieces of wood can be used to hide the tops of the pots and create some slopes. Be aware that these large salamanders are capable of rearranging your careful landscaping. Some moss can also be incorporated into the set up, together with some small caves (either fake plastic ones, or half plant pots), or a log to hide under. 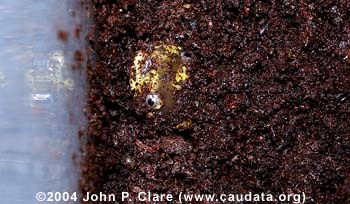 Many people find that some subspecies will dig all the time, whilst others will usually, though not always, remain above the soil but hidden in leaves. Further down the page you will find a step-by-step photographic guide to how the simple vivarium on the right was put together. Lighting is not essential (most, if not all amphibians, don't need a UV light as reptiles do), but if used, make sure the salamander can hide from it if it wishes. A gentle, subdued light is a good idea, and this helps show off the salamander's colours. A timer is a handy gadget to simulate day time and night time. Make sure any lighting you use doesn't overheat the vivarium. The temperature of the vivarium shouldn't exceed about 25 °C / 74 °F during the summer. Normal room temperatures should be fine (15-23 °C). The temperature in my house is usually between 15 °C and 25 °C, depending on the time of year. 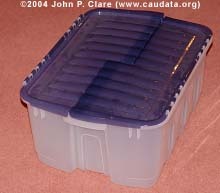 1) Start with a large plastic container (approx. 60x40x25 cm, or 24x16x10 inch). Make sure it has a lid. 2) A nice split interlocking lid like this one is a bonus. 3) Add a layer of large pebbles for drainage, and cover this with 12+ cm (5+ inches) of top soil or compost. 4) I've added a piece of fake bark as some surface cover when the salamanders wish to remain on the surface. 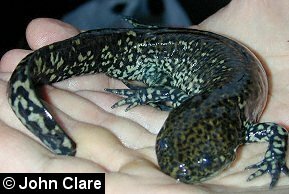 5) Add salamanders (a pair of young Barred Tigers, Ambystoma mavortium mavortium). 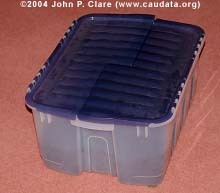 6) Close the lid (make sure there are sizeable air holes around the top). Don't forget to give the soil a little water. 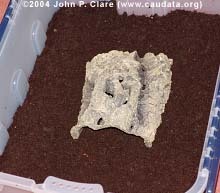 7) This setup is rather spartan, but it could be improved with some moss (dried or fresh) added to the surface, and perhaps a potted plant or two (see text). A note on water bowls: to tiger salamanders, water bowls are public toilets. They will use them simply to defecate! Tiger salamanders and metamorphosed axolotls do not require damp conditions, just an occasional watering of their substrate is ideal. This also means that water bowls are redundant, because these salamanders stay away from water for the majority of the year. If you do use a water bowl, make sure that the water isn't very stale. 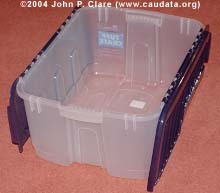 Also make sure the salamander can get in and out of it easily. Ensure the vivarium is humid, though not damp. Soil or compost should not be muddy/sticky, but crumbly. Just ensure it is not "bone dry". Some people opt for a 50/50 water/land vivarium for tigers. 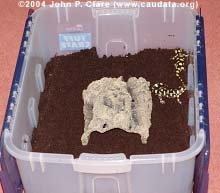 This is good if you wish to keep both larval tigers and adult tigers, or salamanders in the process of metamorphosing, but such a vivarium should be quite large. A 120 cm long (48 inches) aquarium would be the minimum size. A good way of doing this is to use aquarium silicone sealant to position a low piece of glass (about 10-15 cm, 4-6 inches high) that's as wide as the inside of the aquarium into position in the middle of the aquarium. After it has dried (this usually takes about 48 hours), fill one end with soil to bring it up to a similar level to the lip of the glass separator. Fill the other side with water, but make sure the animals can get in and out of the water at their convenience. Don't expect the water to stay pristine though, because the salamanders will often drag the substrate into the water area, or water bowl. Food-wise, feed two or three times a week. They eat earthworms, crickets, waxworms, grasshoppers, moths, flies, spiders, beetles, small mice and other amphibians (I don't recommend the last two because mice have quite a lot of fat in them, and amphibians may pass on any parasites in their guts). Do not leave a lot of uneaten live food to crawl over the salamander as this can distress the salamander - an earthworm or five loose in their tank is ok though. Vitamin/mineral supplements aren't essential but occasionally dusting one of their food items doesn't do any harm. If you plan to breed tigers or metamorphosed axolotls, I wish you luck! This feat is rarely, if ever, accomplished in true captivity. Most reported incidences of "captive" breeding occur under semi-wild conditions, such as in a large greenhouse, or garden, or in many cases the adults are newly caught from the wild on their way to breeding ponds. Depending on the species/subspecies (see the last section of this page), you may have to simulate a hibernation period, but be aware that not all species/subspecies go through true hibernation because their habitat may simply not get cold enough. There is evidence that suggests tiger salamanders are somewhat territorial, particularly males, so don't keep many together unless you have a lot of space. Terrestrial salamanders, and those in the process of metamorphosing, shed their skins periodically. Do not handle them when this is happening, and don't be worried. They usually eat the skin after shedding it. Finally, if you must handle your tiger, don't do it often, and be gentle. Make sure your hands are clean and free of soap and grease. Bacteria and some of the substances on your hands may be harmful to salamanders. 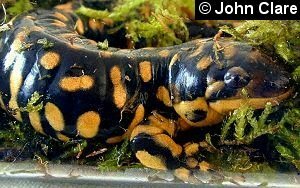 * A revision in the taxonomy of the Tiger Salamander names Ambystoma tigrinum, the Eastern Tiger Salamander, as a full species, as well as Ambystoma californiense (this has been accepted for much longer though). The new revision has lumped all of the other North American subspecies under the Ambystoma mavortium label, implying that all of these are subspecies of A. mavortium (e.g. 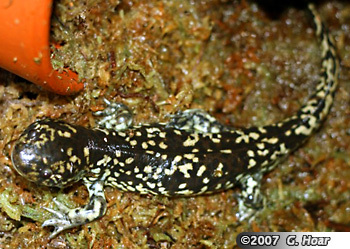 Ambystoma mavortium melanostictum, the Blotched Tiger Salamander). This may be a complex of species in itself. Further information can be found at the Center for North American Herpetology.